Granite is a common and widely occurring type of intrusive, felsic, igneous rock. Granite can be pink to dark gray or even black, depending on their chemistry and mineralogy. Since the beauty of granite is a result of it’s origins in nature, it may contain color variations, surface marks and blemishes. The pattern and color may vary slightly within the same slab, even, though the slabs may have been cut from the same area. Being a product of nature, these variations are not unexpected and add to the unique character and natural beauty of the installation in your home. Paper samples are available for general color selection, but exact match to store samples cannot be guaranteed for your actual countertop. Granite’s natural strength and durability gives it heat and scratch resistance making it a natural choice for countertops. This natural stone is readily available. It’s easy to clean. In a pinch, soap and water will do the job just fine. 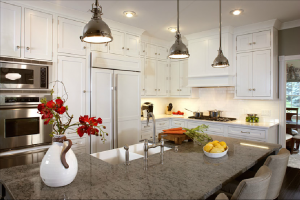 Granite is a porous countertop material. It will harbor bacteria. Granite is not maintenance-free. It should be polished every year. Granite has a proven track record. It’s been around for millions of years. Granite is durable, it will last your lifetime and more. You can cut on it. It is not scratch proof however. You will still admire the beauty of your natural stone five years down the road. It is truly impossible to duplicate the true beauty of granite. Granite is colored all the way through.